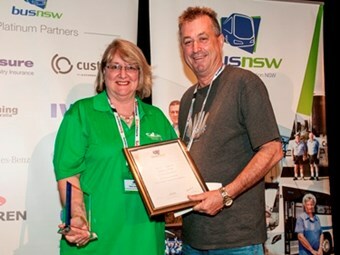 Fresh from bringing a new depot online in Sydney, Veolia Transdev NSW General Manager of Operations Len Kidd is this year’s state winner of the ABCUA Achiever Award, presented at the BusNSW Management Seminar. After many years working in family based operations, Kidd pursued a career with Connex in the late 1990s, which later became Veolia Transdev. Kidd lives and breathes the bus industry, and has played a big part in the success of Veolia Transdev in NSW. In the past 10 years there have been significant changes across the bus industry and it is testament to hard work and commitment that Len Kidd continues to embrace change through these industry shifts. Len has been core to the enormous growth within the business, is actively involved in a diverse range of projects and played a key role in the design and construction of Veolia Transdev’s newest depot at South Granville, which officially opened earlier this year. As an active member of the bus community, Kidd sits on many BusNSW committees and is instrumental in working with Veolia Transdev’s stakeholders. He has been involved in supporting Government with the roll out of new services and customer experience initiatives, including the recent launch of a Veolia Transdev endorsed bus safety education program for school children. According to his award citation, Kidd recognises the importance of relationships in doing business, enabling him to play a key role in business growth activities including acquisitions, tenders, charters and rail replacement work – done in conjunction with local Sydney partners including Punchbowl Bus and Forest Coach Lines. He is regarded by many fellow operators as an optimist, supportive of colleagues and ultimately proud to be part of the bus industry.